Mega Sale! 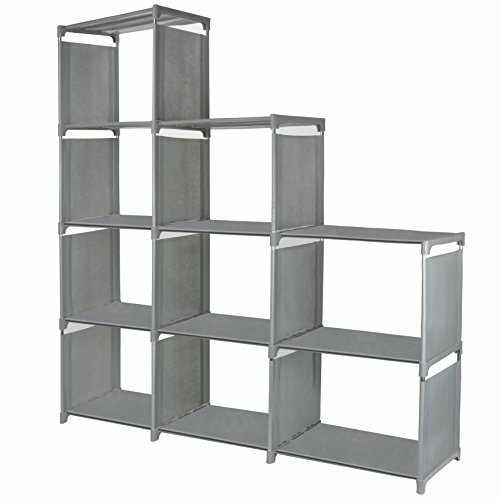 Save 26% on the 9 Cube Storage Shelves, SJHL DIY Modular Closet Organizer Unit and Bookshelf Cabinet for Clothes, Toys, Books and Shoes (Grey) by SJHL at Indsight. MPN: SJHL0. Hurry! Limited time offer. Offer valid only while supplies last. Product Features: 1. Material: Iron Tubes, Plastic Connectors, Non-Woven Fabric 2. Colors Options: 2 (Black, Grey) 3. Size: 46.5''L x 11''W x 49''H 4. How to solve the mess in your house?? SJHL 9-Cube storage shelves provides more space for storage and keeps your home well organized and neat. As Bookshelf: No more worry about arranging too many books. The cube organizer is strong enough to fill it all by books. As Clothes Shelf: There are 9 cubes in each set of cube storage, every cube is large enough to organize your sweater, pants or socks organized so that you can get what you want easily. As Toy Organizer: Keep toys and magazines on this shelf, little ones can fetch what they want easily. Also, it is convenient to store anything you like. Order your 9 Cube Shelves now! If you have any questions about this product by SJHL, contact us by completing and submitting the form below. If you are looking for a specif part number, please include it with your message.